https://img.alicdn.com/imgextra/i1/723293564/TB2ZggDENGYBuNjy0FnXXX5lpXa_! !723293564.jpg https://img.alicdn.com/imgextra/i1/723293564/TB2YC90wDXYBeNkHFrdXXciuVXa_! !723293564.jpg https://img.alicdn.com/imgextra/i4/723293564/TB2_rZenh9YBuNjy0FfXXXIsVXa_! !723293564.jpg https://img.alicdn.com/imgextra/i4/723293564/TB2eedkcVyZBuNjt_jJXXbDlXXa_! !723293564.jpg https://img.alicdn.com/imgextra/i4/723293564/TB2HFH5k9YTBKNjSZKbXXXJ8pXa_! !723293564.jpg https://img.alicdn.com/imgextra/i1/723293564/TB2U95fwviSBuNkSnhJXXbDcpXa_! !723293564.jpg https://img.alicdn.com/imgextra/i2/723293564/TB2Fm9fwviSBuNkSnhJXXbDcpXa_! !723293564.jpg https://img.alicdn.com/imgextra/i1/723293564/TB26Q.ok8nTBKNjSZPfXXbf1XXa_! !723293564.jpg https://img.alicdn.com/imgextra/i1/723293564/TB2v9B2E_tYBeNjy1XdXXXXyVXa_! !723293564.jpg https://img.alicdn.com/imgextra/i2/723293564/TB2uOOclljTBKNjSZFNXXasFXXa_! !723293564.jpg https://img.alicdn.com/imgextra/i4/723293564/TB2IaVaE9tYBeNjSspkXXbU8VXa_! !723293564.jpg https://img.alicdn.com/imgextra/i4/723293564/TB2s468EQOWBuNjSsppXXXPgpXa_! !723293564.jpg https://img.alicdn.com/imgextra/i3/723293564/TB2Ga_yEL9TBuNjy1zbXXXpepXa_! !723293564.jpg https://img.alicdn.com/imgextra/i3/723293564/TB2cbSCEMaTBuNjSszfXXXgfpXa_! !723293564.jpg https://img.alicdn.com/imgextra/i2/723293564/TB2YjrDEH5YBuNjSspoXXbeNFXa_! !723293564.jpg https://img.alicdn.com/imgextra/i3/723293564/TB2RADhEKuSBuNjSsplXXbe8pXa_! !723293564.jpg https://img.alicdn.com/imgextra/i2/723293564/TB2QIiOliQnBKNjSZFmXXcApVXa_! !723293564.jpg https://img.alicdn.com/imgextra/i3/723293564/TB2zYf1EQCWBuNjy0FaXXXUlXXa_! !723293564.jpg https://img.alicdn.com/imgextra/i1/723293564/TB2fv1jlfImBKNjSZFlXXc43FXa_! !723293564.jpg https://img.alicdn.com/imgextra/i2/723293564/TB2jafMEHSYBuNjSspiXXXNzpXa_! !723293564.jpg https://img.alicdn.com/imgextra/i3/723293564/TB2dlwok8nTBKNjSZPfXXbf1XXa_! !723293564.jpg https://img.alicdn.com/imgextra/i2/723293564/TB2kz5LlbsrBKNjSZFpXXcXhFXa_! !723293564.jpg https://img.alicdn.com/imgextra/i1/723293564/TB2KjQwk0cnBKNjSZR0XXcFqFXa_! !723293564.jpg https://img.alicdn.com/imgextra/i1/723293564/TB2NkYhEKuSBuNjSsplXXbe8pXa_! !723293564.jpg https://img.alicdn.com/imgextra/i3/723293564/TB2E8W1XwZupeRjt_jqXXcfAFXa_! !723293564.jpg https://img.alicdn.com/imgextra/i2/723293564/TB2poeMwBmWBuNkSndVXXcsApXa_! !723293564.jpg https://img.alicdn.com/imgextra/i2/723293564/TB2k8WdlljTBKNjSZFwXXcG4XXa_! !723293564.jpg https://img.alicdn.com/imgextra/i2/723293564/TB2fGaYwvuSBuNkHFqDXXXfhVXa_! !723293564.jpg https://img.alicdn.com/imgextra/i2/723293564/TB2asSqlnqWBKNjSZFxXXcpLpXa_! !723293564.jpg https://img.alicdn.com/imgextra/i1/723293564/TB2rM0Rc.D.BuNjt_h7XXaNDVXa_! !723293564.jpg https://img.alicdn.com/imgextra/i1/723293564/TB212jZEL5TBuNjSspmXXaDRVXa_! !723293564.jpg https://img.alicdn.com/imgextra/i4/723293564/TB2PhxSlcj_B1NjSZFHXXaDWpXa_! !723293564.jpg https://img.alicdn.com/imgextra/i3/723293564/TB2pb5pgMKTBuNkSne1XXaJoXXa_! !723293564.jpg https://img.alicdn.com/imgextra/i3/723293564/TB2F4Menh9YBuNjy0FfXXXIsVXa_! !723293564.jpg https://img.alicdn.com/imgextra/i3/723293564/TB2ZkNifrBnpuFjSZFGXXX51pXa_! !723293564.jpg https://img.alicdn.com/imgextra/i4/723293564/TB24exrfxBmpuFjSZFsXXcXpFXa_! !723293564.jpg Material selection The cowhide currently used in the “tangent pie” is all from Italian A-grade multi-fat vegetable tanned leather. Because it is a natural material, and the processing method used by the skinning factory is the vegetable tanning process that minimizes the damage to the cortex, there are inevitably a small amount of "scar" and "wrinkle" and "blood band" on the leather surface. When we open the material, we will try to avoid it, or put these parts in the parts of the product that are not obvious or unstressed. 2. Handmade stitching We did not use a sewing machine to make our products, all of which were hand-stitched. Before sewing, you need to use a special diamond to punch the suture hole on the leather. Only in this way can you sew a beautiful wavy stitching effect, which is the biggest difference from the sewing thread of the machine. 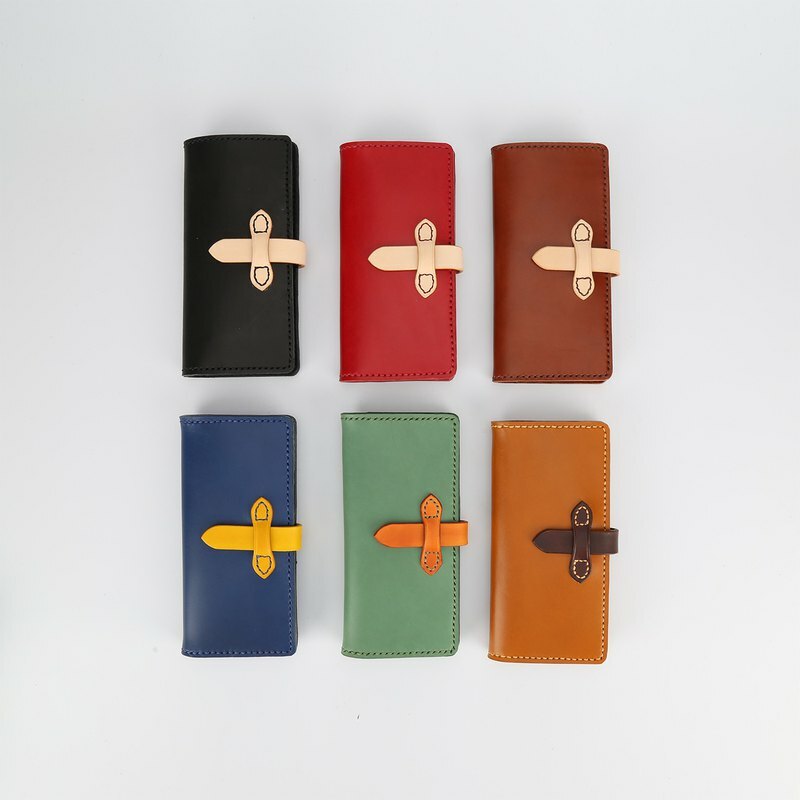 Although this will greatly increase the production time of leather goods, it is also an important step for the leather craftsman to give the leather soul and warm hand. 3. Hand-polished and polished. Before the final product is finished, the last step is to polish the edge of the leather. In order to make the leather look smooth, round and natural. The “tangent pie” has its own set of edge sealing methods. First use sandpaper to sharpen the sharp side of the leather edge, then apply a layer of edge sealant to make the leather edge look flat. Repeat 2-3 times, then apply a layer of edge sealing wax, and then polish it with a polished rod. Until the leather looks smooth. 4. Hand dyed leather The “tangent” hand-dyed products currently use Fiebing's leather alcohol dyes imported from the United States. In order to dye evenly and naturally, we need to wet the leather surface with water, and then apply the dye over and over again with a sponge, from light to deep, until we reach the color we want. After drying, a layer of fixing agent is added to increase the color fastness. Finally, use water to apply on the surface of the skin, wipe off the dust on the surface and make the color more uniform. Because it is hand-dyed, there is a subtle product between the colors of each bag, each one is unique.